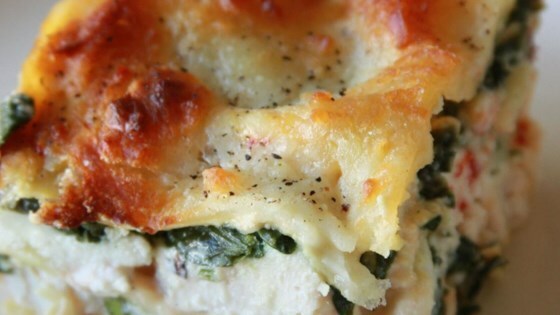 "Lasagna Alfredo with chicken, ricotta and spinach. So good that my family requests it at least once a week. Serve with diced tomato as a garnish." Bring a large pot of lightly salted water to a boil. Add pasta and cook for 8 to 10 minutes or until al dente; drain. Cook spinach according to package directions; drain. In a 9 x 13 baking dish, place one layer of lasagna noodles, edges overlapping. Pour chicken and Alfredo sauce mixture over noodle layer and spread evenly. Sprinkle 1 cup of shredded mozzarella over chicken mixture. Top with another layer of noodles. Spread spinach mixture evenly over noodles. Pour 1/2 of remaining jar of Alfredo sauce over spinach mixture, spread evenly. Sprinkle another cup of mozzarella over sauce, lay on the final noodle layer and top with remaining 1/2 jar of Alfredo sauce, 2 cups of mozzarella, and salt and pepper to taste. Bake 50 to 60 minutes, until top is brown and bubbly.